The rear slide is the bedroom and the front slide is the lounge/dining area. Living area, still cleaning it hence, boxes on seats. Sleeps 7. Over the top of the driver’s area is a powered bunk, and the both seating areas become double beds. Looking back the other way showing kitchen with hob, oven and microwave, double American style fridge/freezer, the electric fire with the TV above, and beyond you can see the master bedroom with ensuite bathroom. Behind the TV area there is another loo and washroom, which you can use on the road when the slides are in. As some of you may know we came to Florida to buy the RV because it seemed to have the most dealers selling Tiffins (RV Make) and we were looking for a particular model, an Allegro 36LA. Well we set off to our FIRST dealer yesterday Palm Beach RV and when we arrived thought we had made a mistake as they seemed to specialise in 5th wheels (articulated caravan) and caravans. Went into the dealership and they said we do have some gas (petrol) RVs can we show you them. So we agreed and the first was a Fleetwood that was only a year old but we were not very impressed. So we moved on and it turned out that the others they had were Diesel Pushers (engine in back) and too long for the UK in case we wanted to take it back. So we were about to leave when the manager says we have just had a 2016 Winnebago in on part exchange would you like to see it. 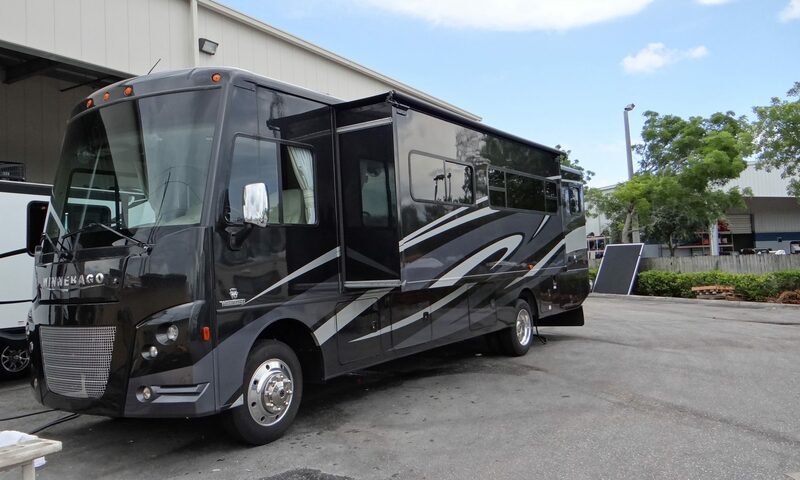 We said yes, and it turned out to be a 2016 SunStar LX 35F (35ft) with almost exactly the same floor plan as the Tiffin 36LA. 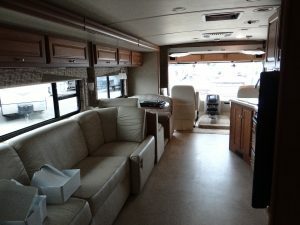 Now we didn’t know too much about Winnebagos since we had been concentrating on Tiffins, but it looked in excellent condition and the cleaners had just got to it, so it definitely was new in!! We looked around and to be honest it ticked all the same boxes as the Tiffin, but it was out of our price range ($124K). So we were about to leave when he mentioned he could reduce the price. What to I asked, $95,000 he thought he could get down to, so we said we would have to go away and think about it. Came back to Christopher’s (my nephew) and looked up the prices of that make, model and year and they were averaging $121K, so we weren’t being ripped off!!. As luck had it Christopher was off work early so we took him back to look at it with us. He was impressed, as we were the second time around and further cleaning having been done. 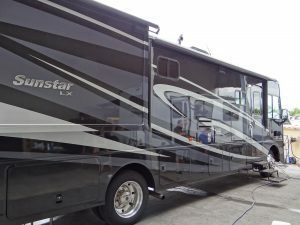 So the haggling began and we are now the proud owners of a Winnebago SunStar LX 35F with lots of extras, including a training course and vehicle prep!! Pick it up next Thursday 6th July!! Didn’t expect to make a decision that quick, but both Anne and I were very impressed with the vehicle and the price was too good to miss. Christopher reckoned they wanted to make their end of month sales figures a bit better!! 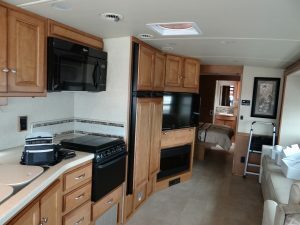 Will get pictures up as soon as we have them, but didn’t expect to buy an RV so soon so forgot when we were there!! Amazingly setting up a Bank account was much faster than hiring a car!! Very good service from Citibank. Account, temporary ATM card and online access set up in less than an hour!! Trialled transfer of funds via TranferWise and that seems to have worked, but won’t know for certain until tomorrow (Wednesday). Off to look at RVs today. After Virgin Atlantic to Atlanta, and Delta to Orlando, a 1 3/4 hr wait for a car hire (thanks Budget will not use you again) arrived at my nephew’s Christopher at 11.30pm knackered!! Suitably refreshed by Monday morning we now proceed to hopefully open a Bank Account. Flights all booked. Leave on Virgin Atlantic from Heathrow to Atlanta and then Delta down to Orlando on Sunday 25th 11am. Car hire in Orlando to Jupiter where my nephew Christopher and his wife Lilia live. 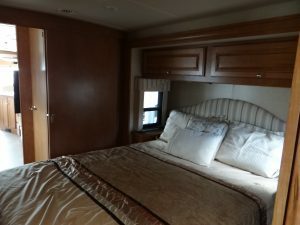 Welcome to the Jordan’s RV blog. 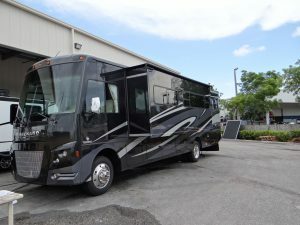 This where we hope to log everything from travelling to the US to buy the RV, to using it to travel around the US and beyond.